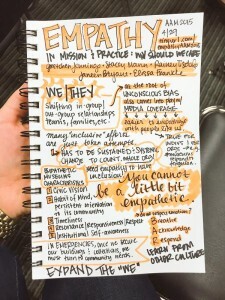 Sketch of Empathy in Mission & Practice Session at AAM15 by Shaelyn Amaio. We now have a website, www.empatheticmuseum.weebly.com and a twitter handle @EmpatheticMuse and hashtag #empatheticmuseum. You can also contact us directly on empatheticmuseum@gmail.com. The website features information on upcoming presentations as well as case studies of empathetic museum practice. Read the current offering by Janeen Bryant on her work with Eastern State Penitentiary Museum as they shifted their focus to an examination of mass incarceration and prison reform. Our regular membership ebbs and flows as folks take time to work on other projects. Original members Stacey Mann, Janeen Bryant, and I remain, and this year we were joined by Jess Konigsberg, who has been especially helpful with social media, and Jim Cullen, who brought his expertise in organizational consulting to bear on the characteristics of the Empathetic Museum. Jim’s insight brought an entirely new paradigm to our work, the Maturity Model, which I’ll discuss below. We also collaborated with the Museums and Race initiative, #museumworkersspeak, and Museum Hue to present a program at the Museums and Race Gathering for Justice and Transformation at the AAM conference in Washington, DC in May. At this session, attended by about 75 people, we rolled out the Maturity Model as a tool for internal museum transformation, and also collected comments and critiques of the model. We’ve incorporated many of these in the version we’re now using. In addition to hosting the AAM session in May, members are presenting in a variety of venues as part of the Museums and Race initiative. We ran a brief workshop at MAAM, the Mid Atlantic Museums Association conference, in October, and just hosted another at NEMA, the New England Museums Association conference, on November 10. So far in 2017 we are scheduled to present at the Small Museums Association conference in College Park, MD, in February. We’ll also be talking with a number of museum studies classes both this year and next. During the last year Jim Cullen has helped us reframe the five characteristics of an Empathetic Museum as a Maturity Model. You can see an example on our webpage. 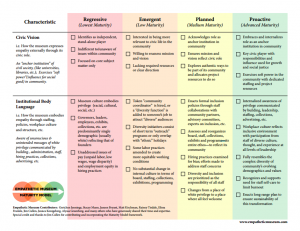 This rubric is used by many types of organizations to examine mission, guidelines, and procedures and to facilitate organizational change. Our model helps a museum to chart its progress (or lack thereof) toward institutional empathy across a series of standards from regressive through emergent to pro-active. Our model is always a work in progress, and is meant to serve as a series of guidelines rather than as a rigid checklist. If you would like to learn more about the model and about how to use it at your museum, please contact us at empatheticmuseum@gmail.com and we’ll get back to you. Given the recent election of Donald Trump, whose words and actions towards many groups of people have been so lacking in empathy, I think it is more important than ever for museums to model and embody empathetic practice and inclusiveness. As cultural institutions we have an obligation to preserve and enforce those aspects of our heritage that are tolerant, compassionate, and respectful of difference, and to work against, in an open way, our traditions of white privilege, racism, inequality, and oppression. What are your thoughts on the role(s) of museums as we enter a new political era? If you are reading this as an email you can comment by going to www.museumcommons.com or by sending a tweet to @gretchjenn or to@EmpatheticMuse or #empatheticmuseum. November 14, 2016 in Empathetic Museum.